The 4mm drop Pure Grit drops 0.3 oz to 9.6 oz and gets a very cool 3D printed upper with 10% rubber in the printed overlay materials. The idea is that the rubber component provides stretch and thus a better fit while also providing structure and durability. We tried a pair on and the upper felt very secure and comfortable. 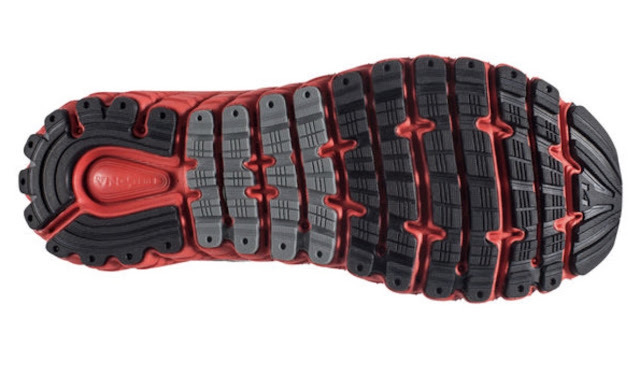 The midfoot strap of the Pure Grit 5 is eliminated. A lace keeper pocket is added. 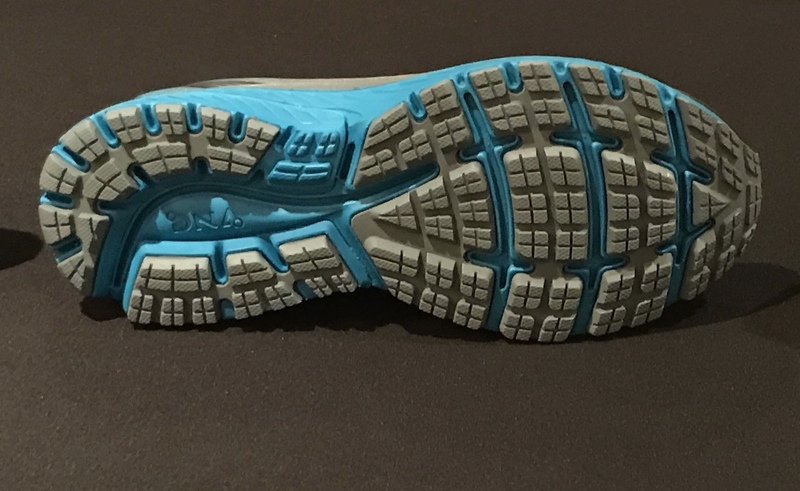 The upper construction is noticeably more streamlined and we think will be more accommodating to different foot shapes when compared to the PureGrit 5 below. 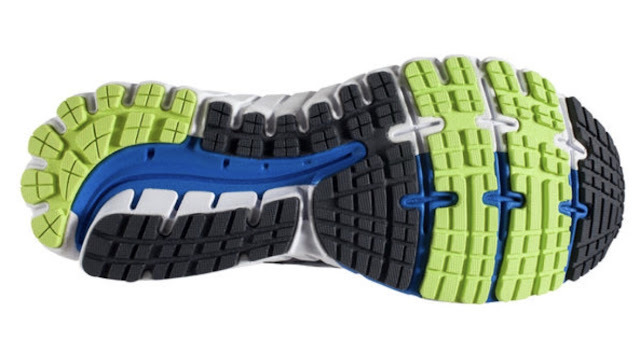 The underfoot platform remains the same with the 3D Hex lugs reinforced for added durability and the flexibility enhanced. 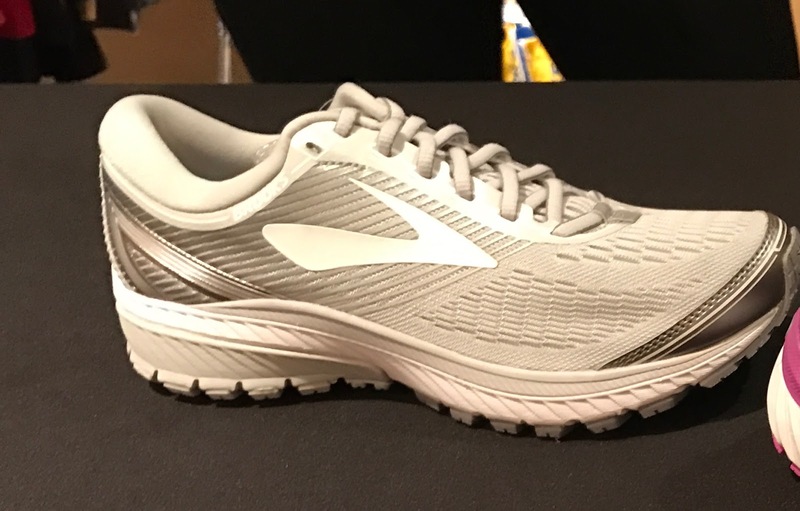 A key focus of the presentation was the update to the Glycerin premium neutral trainer. It will have a softer top stack (the purple layer) and it now a full top stack, a softer lateral side, and the entire upper now has 3D stretch print. 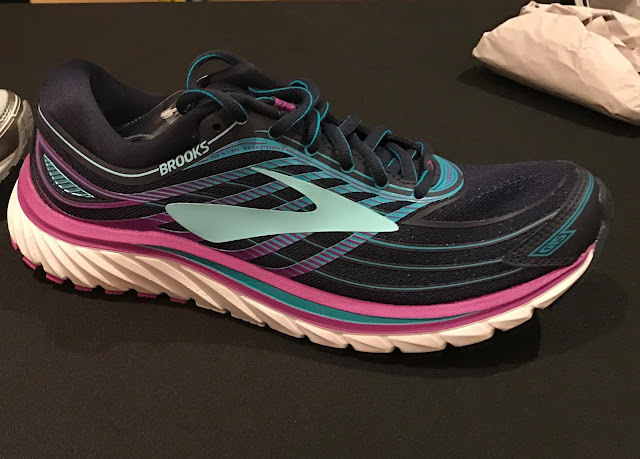 Significant changes come to the outsole geometry with greater segmentation, more sculpting out of the center of midsole and less of flat edge to edge platform at mid foot. We might expect that landings and transitions will be far smoother than in the 14 and that the Glyerin will feel more like a neutral shoe than something between neutral and support. 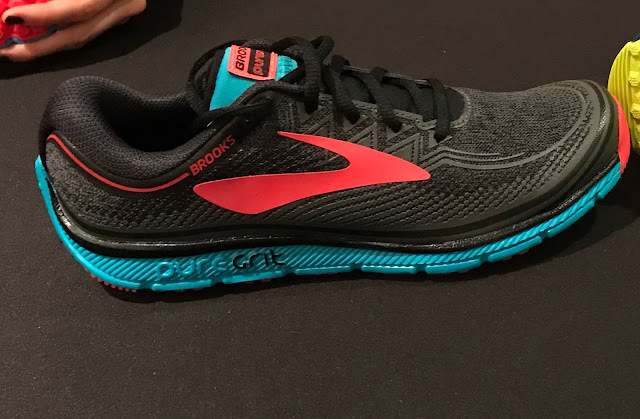 Brooks has the Transcend 4 for that. The Ghost drops 0.2 oz from the 9th edition. We like the "ghostly" colorway below. A Gore-Tex version at $150 will be available in August 2017. 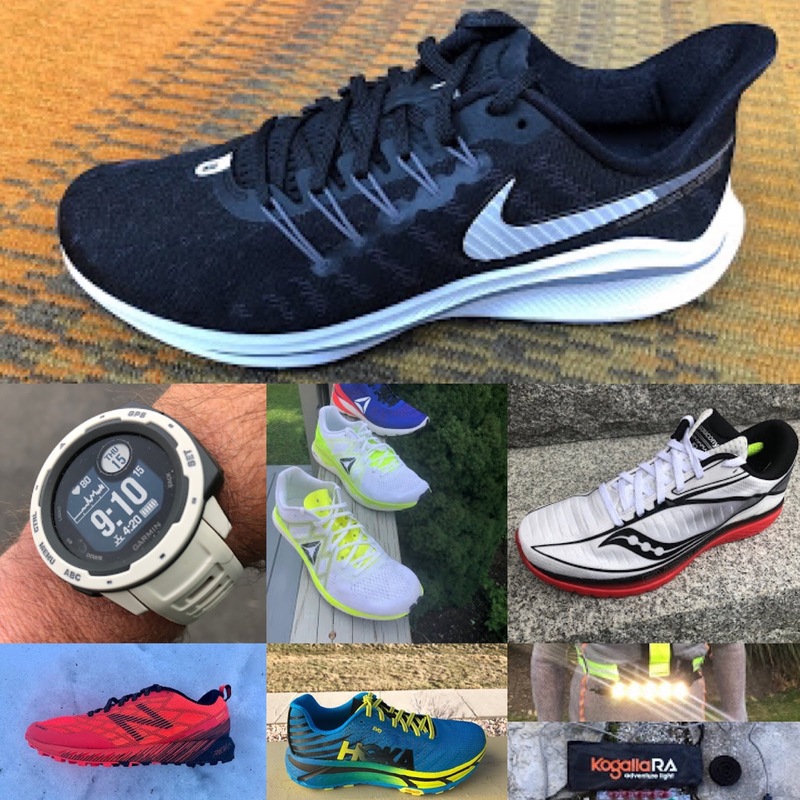 Brooks told us the Ghost 9 is the #1 selling shoe in speciality running stores. We look forward to testing the Ghost 10. 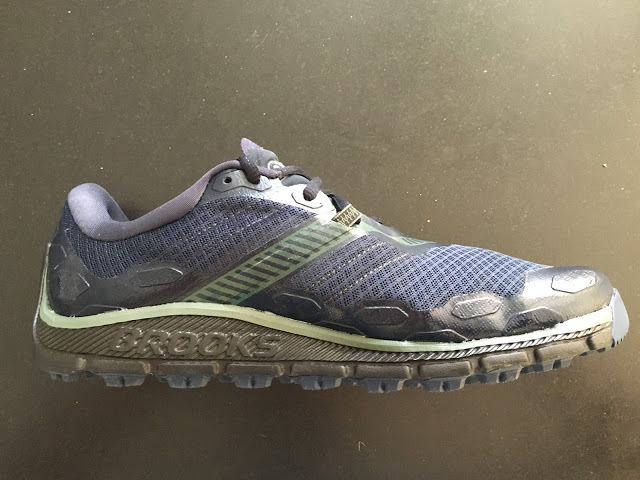 As illustrated below many Brooks neutral shoes share a similar outsole geometry of what Brooks calls a Plush Transition Zone at mid foot and a Segmented Crash Pad to promote "soft and smooth transitions." A new shoe the Revel features an engineered flat knit upper with internal booty. Also available in various combinations of white, gray and black it joins the trend for high performance running shoes with street every day style, At $100 it is very fairly priced. The GTS 17 will also come in a heathered circular knit editipn. 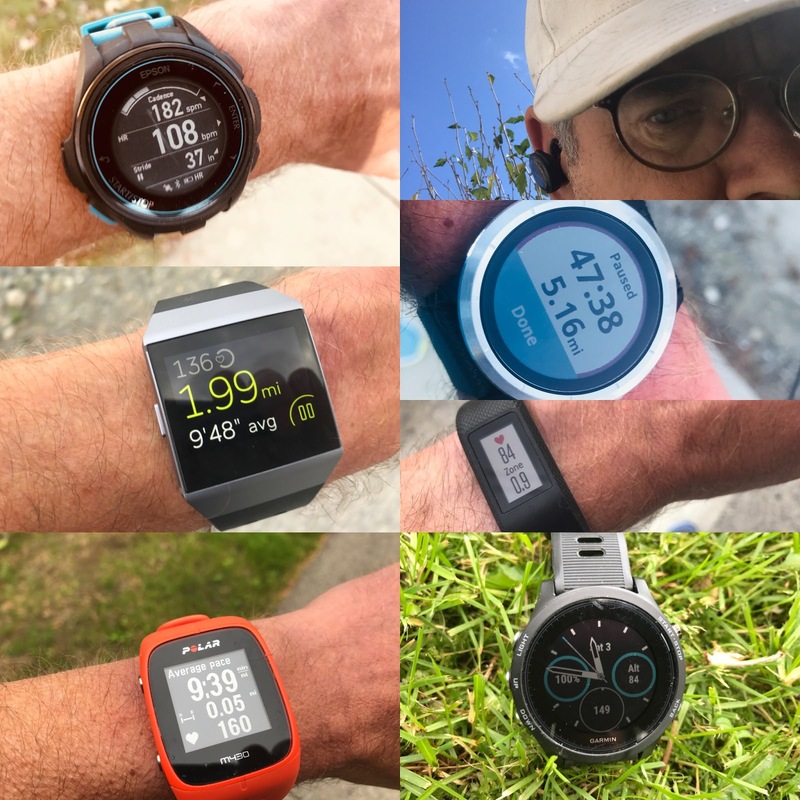 Any comments on the fit of the puregrit compared to previous versions? I like the puregrits, but find the toebox a bit too narrow. Alexander, I only had a quick try on of a half size up PureGrit 6. The fit was excellent. By removing the heavy denser toe cap that extended over the top of the toes replacing it with the 3D print with rubber in the mix. While the last is the same, I think the toe area will be more comfortable yet still supportive. I added a picture of the PG5 to the preview for comparison. Thanks for reading! Sam, Editor.